A great work of reference for inventors, experimenters, mechanical students, artisans and anyone with an inquiring mind and the ambition of an engineer. For anyone with a real interest in mechanical thought and work, the book covers gears, pullys in combinations never thought of, it covers clock mechanisms, lifting and rotating mechanisms, impact and pounding machines. Click on MORE INFO for examples. This book will keep you up at night thinking. Mechanical Movements explores the borders of inventive design through a review of the ingenuity, creativity and sheer brilliance of engineers and inventors that have artfully overcome obstacles with superior mechanical designs. 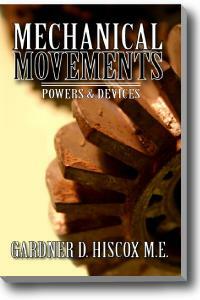 It clearly and concisely describes and draws out the principles and facts in constructive and operative mechanics. This book contains a huge collection images which illustrate a wide range of mechanical motions, devices, and technologies, and to places them in an excellent format for ready reference. Mechanical concepts and details are ideally presented to the mind by dia­grams or illustrated forms. This book provides a simple and fast method for understanding the exact conditions of mechanical actions and construction. The images are accompanied by sufficient text to explain the general principles of construction and operation, and mechanical forms shown. Mechanical Movements will convey to you, via illustrations and short attached descriptions, the most important principles and facts in constructive art. This book was specifically designed for quick and easy use. 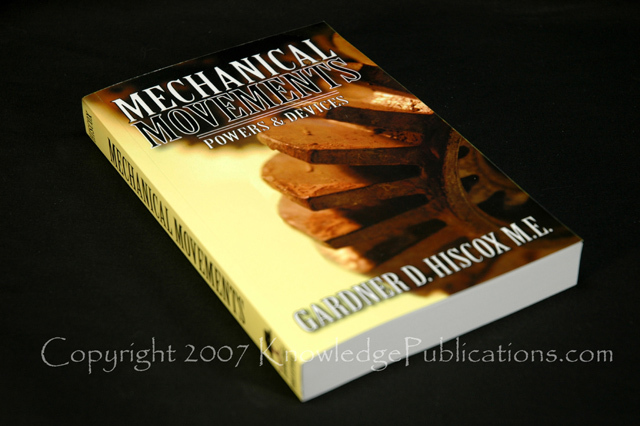 We have republished Mechanical Movements in order to place a huge amount of illustrated practical mechanical knowledge in YOUR hands; all within one phenomenal book. The sheave and hook rises equal to one-half the difference in the circumference of the barrels for each turn of the crank. See No. 27 for the power. The long lever and finger stud is linked to a ratchet lever concen­tric with the type line barrel. One touch of the finger stud for close lines and two touches for open lines. from vertical to horizontal shaft, with tension slide and weight. , alternating double and single links. A bicycle novelty. One revolution of A gives two revolutions of B. A is an elliptic bevel gear central on the shaft. B is an elliptic bevel gear of one-half the num­ber of teeth of A and revolves on one of its elliptic centers. The cranks are set oppo­site to ,the short diameter of the driving gear A, giving greater power to the tread and quicker motion at the neutral points of the crank. E is the fixed point; F the tracer. The disc has a sharp edge and a cylindrical section divided and read from a vernier scale. A worm screw and index wheel indicate the number of revolutions of the rolling disc. A central vertical water and steam drum, with bent tubes expanded in it, and inclined to facili­tate circulation. with trip poppet valves for steam. The governor releases the valves by varying the position of the vertical bars connected to the rocking wrist plate. Exhaust valves are operated from the eccentric through the lever that operates the steam valves. A revolving cylinder engine. Three cylinders, A, A, A, radiate from a shaft set eccentric to an outer circle or ring on which the piston connected sheaves revolve. The pistons take steam through the ports M, M, M, just past the shortest eccentric radius, and drives out the piston during a half revolution, when the exhaust is opened and the piston is pushed back by the eccentric ring.